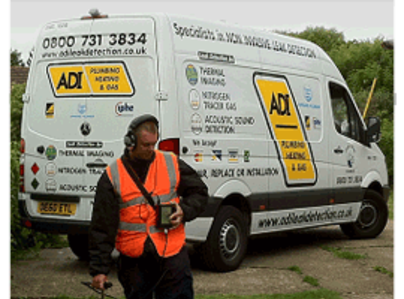 ADI are the leading specialist in leak detection technology. Our water leak detection services help many domestic homeowners, landlords, tenants & businesses in all sectors (industrial and commercial) every single day. Here at ADI Leak Detection our priority is on locating & repairing your water leak as soon as possible in the most cost effective manner for you. 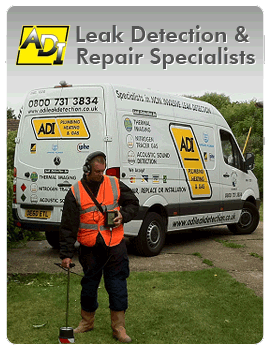 ADI carries out leak detection on any pipe work in your floors, walls, ceilings and much, much more. Using fully qualified engineers and specialist technology we can proudly say we have a high success rate in not only locating your leak but repairing it too, usually in the same day! Give ADI a call and see how we can help you. My tenant was desperate as the boiler and their heating cutting out repeatedly over a couple of months. Four plumbers came on site and sent me bills for £1459 without affecting the problem in any way. I Googled the "cause of pressure loss in a heating system" and found that it is caused by a leak in either the boiler or the heating pipes in the house. It wasn't the boiler so it had to be a pipe in the house. I discovered ADI Leak Detection. I spoke to Adrian who took me through the various processes they would use to discover where the leak was. It would be safe, sophisticated and they would dedicate the whole day to the job. He spoke in a way that inspired trust and I felt that he was competent. What a relief! His engineer Adam came the following day, found and repaired the leak and charged exactly what he had quoted. I am absolutely delighted and grateful. Thank you Adam! I was informed by the water board that there is a substantial leak somewhere between the water meter and my house. I called ADI who sent contractor a few days later. He spent about 3 hours trying to locate it using some basic listening equipment. He concluded that the leak must be underneath the property, because he couldn’t locate it, and recommended a new pipe to be laid between the house and water meter at an estimated cost of £3500. I was charged £600 by ADI for this three hour visit. My insurance refused to pay for this new pipeline because the leak had not been located. As a result of this, I was forced to use another contractor (who was recommended by the water board) to locate the leak. They located it within two hours, using specialist equipment, and it was underneath the drive way (not underneath the house as concluded by ADI). The £600 that I paid to ADI was a complete waste of money because the service was substandard and resulted in the wrong conclusion. I suggest that others do not use them. Great workmanship. Material charges are however fictitious, the last invoice charged £200 for materials when should be no more than £50. It was going through insurance. If paying yourself, do challenge this as its just not right. After receiving a huge water bill we realised that we had a serious problem on our hands... contacted several companies and ADI were definitely the most professional from the first phone call. Everything was explained to me in details on how they would locate the leak and Adrian was ever so patient with all my many questions! I would say that they were not the cheapest BUT they sent 2 engineers so the problem could be isolated that day AND fixed as well so we would not have to pay anything further, all the other companies I had contacted could not do repairs so in the long run we probably would have ended up paying more and have the leak going even longer until we had found someone to fix it (at 1 litre of water escaping every 2 minutes could have been quite expensive!) I was not there on the day the engineers came (the lead engineer was Vince) but all went well on the day and the problem was swiftly sorted with absolutely no surprises on costs on the day, just as I was told. Would definitely use ADI again and recommend them to anyone. The engineer arrived on time and professionally carried out the leak detection test using the gas detection technique. The engineer was very helpful and highly professional in his approach to the problem. He soon found the source of the leak under the floor boards and this leak repair is now being attended to . The back up office staff, for providing the quotation for the work and issuing the reports of the inspections plus dealing with any paperwork for this work, dealt with quickly and efficiently and were very helpful in dealing with any queries. ADI's service was excellent and I would definitely use them again should the need arise. Very impressed with the Service given by this Company. I can only speak to highly of this Tradesman (Vince) who came to find the water leak in my home. He arrived on time and was very professional in his approach to the problem. What I was especially impressed with was the way that he included me in the investigation work that he carried out to find the source of the water leak. He did find the source of the problem which has now been attended to by the Tradesman who constructed my Conservatory and all is now dry and back to normal. Thank you ADI a job well done. The engineer was able to quickly locate the source of the underfloor leak using gas detection techniques which I'd never seen or heard about before! Once the leak was found, we only had to raise a few boards and replace the defective pipe. Very impressive work carried out quickly and to highly professional standards! Does what it says on the tin! Customer service team very effective and helpful. Plumber arrived on time on the day and carried out various tests to identify where the leak was coming from. Once identified, then put it right. Problem solved. Stress level reduced. Thank you. Marks experience meant he was able to find my leak very quickly. He went on to test the rest of my heating to ensure there were no other leaks. Excellent. ADI technician arrived fully equipped to detect water leak in concrete slab in 4th floor apartment. Detected leak, exposed leak by cracking into slab & men fixed the leak. Great job!